The pavilions for the Burnham Centennial join the ongoing list of dynamic and engaging exhibits that have been displayed at Millennium Park. The pavilions were commissioned to Pritzker Prize winning architect Zaha Hadid and UNStudio's Ben van Berkel. While there was some tension in the architecture community about chosing two foreign (to Chicago, that is) designers, a global city, much like the one Burnham envisioned, should integrate different sensibilities with ease. 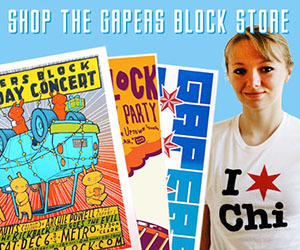 The true struggle, however, is not whether Chicago will accept the company of two talented designers, but will the designers allow Chicago to inform their own design process. At first glance, the UNStudio pavilion may illicit some negative feelings from those who recall the de-humanizing effect of raised building platforms and piloti employed by Modern architects. However, after some observation, the platform is acutally a smartly designed bench intended to pursuade park visitors to linger. This platform also gives the plenum space needed for daziling night-time lighting effects. Moving around the drooped openings, the massive cantilevered roof structure immediately recalls Frank Lloyd Wright's ability to compress and expand space with horizontal planes. To that effect, UNStudio's effort to "surprise us" with views of the city is both successful and legitimately urban. Just as one can wander around parts of the city and catch a glimpse of a familiar building from an unfamiliar angle, the pavilion frames vantage points that make the portions of the skyline seem wholly unique -- as though the Smurfit-Stone building and Trump tower were a single building block in the city's composition. This vitality is not solely confined to particular vignettes. Like all great public art, the designer must realize that, to some extent, they are simply providing kindling that requires people to set it ablaze. It is unexpected how dynamic the pavilion becomes when populated by dozens of people maneuvering around its awkward footprint. The sculpture allows for accidental meetings of visitors as they emerge around the peeled down supports and find themselves face-to-face with another staring up through the openings. In this sense, the pavilion is a city unto itself, a series of intimate, accidental meetings set with in a dense urban context. Appropriately enough, the material used for the skin, wood panelling with a durable coat, has begun to show signs of overuse. In an odd poetic twist, people have been trying to climb through the openings to elevate themselves above the urban fray. To guarantee that the pavilion survives the summer, it has been temporarily closed for renovations. Zaha Hadid's pavilion bears no such burden of material limitations. The ingenious system of fabric panels zippered together allows the cloth a snug fit over the bent aluminum frame. The zippers end up working with the hidden structure to create a system of contours that reinforces the futuristic shape. Despite its technical achievement, location and context seem irrelevant to Hadid's creation. While a reference to to Chicago's diagonal streets is mentioned in the design's explanation, it is only until a video is played on the interior that the pavilion's connection to Chicago seems more than arbitrary. The video itself is wonderfully engaging and informative, and the interior space provides a unique theater; but the sculpture's role is little more than a glorified movie screen. Perhaps if the pavilion's purpose was to demonstrate Hadid's deftness at using daring forms it would be more palatable, but for an installation that is to have some correlation to Chicago or Burnham's plan, Hadid seems to be the one on display. Even the way that people are to interact with the structure seems detached from the urban environment. There is an explicitly designated path to move from one portal to the other, ownership of experience does not reside with the visitor, but has been predetermined. 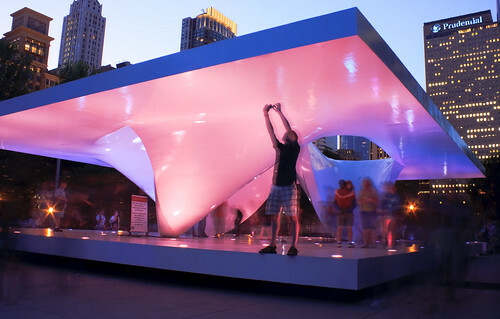 The most intriguing experience of the pavilion is from afar, particularly at night, when the piece glows providing great contrast with the rigidity of the Michigan Avenue streetwall. Perhaps Hadid's piece is a reaction to the true global nature of today's large cities, where the lines of context become blurred and architecture can exist as pure "form-making." However, for an exhibit that is supposed to be a celebration of Burnham's Plan, or at least the city it created, some recognition of its locality probably would have been more appropriate. In this regard, UNStudio's pavilion should be considered an absolute success. Their design merged an unique design sensibility with the loaded historical context of 100 years of urban life. 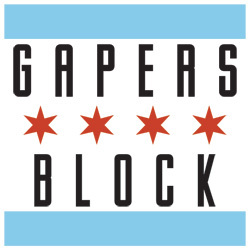 Carl Giometti is a Gapers Block staffer who spends his days as an urban theorist disguised as an architect. He tries to professionally and socially associate with anyone else who can enthusiastically talk about public transportation. His wife, as evidence of her fervor for urban planning, is currently asleep with their two cats as he writes this.